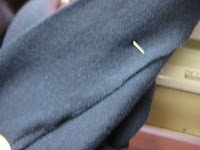 Once in a while you get a garment home from the store and realize that it is defective. Actually, if you are careful to inspect your things before you buy, you may have seen this defect in the store and asked for a discounted price. Once you examine it, you may be confused as to how to fix it. 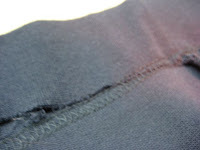 The chain stitching done by the manufacturer looks good on the outside, but missed the hem part way around the inside. First of all, don't remove any of the stitching. 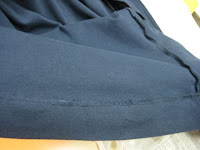 What I did with this skirt, was to push that unattached hem up over the stitching that remains on the front of the skirt. This will create a bit of a wrinkle in the hem allowance. That's ok, and it will be pressed down. It will show on the under side, but not on the front. 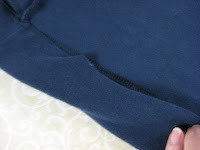 I wanted to pin this so that it remains in place, because when I do the actual sewing, it will be on the front of the skirt, so I can't see if the hem allowance is catching. Finding a good match on thread color is critical, so the job doesn't look like it was done by those "loving hands at home". The inside of the skirt now looks like this. 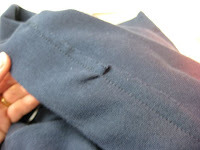 When is it Time to Hire a Seamstress? Ohhh Thanksgiving... Time to Let Out Your Slacks? Christening Gown Alterations are Finished!